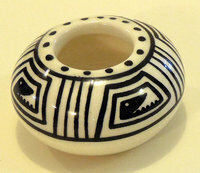 This miniature kiva jar, was inspired by a Mesa Verde Black-on-White pot housed in the Mesa Verde Chapin Mesa Archaeological Museum. It is believed that Ancient Puebloans used kiva jars to store special materials such as planting seeds, weaving and ritual supplies. Lead-free, microwave and dishwasher safe. Approximately 3.5" x 2". Handcrafted by Designs by Anna in Durango, Colorado. 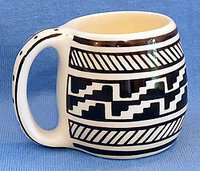 This miniature mug was inspired by a square mug found at Sand Canyon Pueblo and illustrates the rich diversity of Mesa Verde Black-on-White pottery produced by the Ancestral Puebloans. Lead-free, microwave and dishwasher safe. Approximately 1.75" x 2". Handcrafted by Designs by Anna in Durango, Colorado. 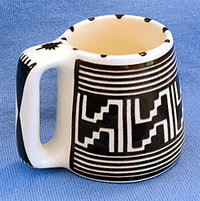 This miniature mug was inspired by a Mesa Verde Black-on-White pot housed at the Chapin Mesa Archaeological Museum. 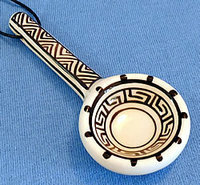 It has the classic Mesa Verde banding and solid kiva step motif. Kiva steps are believed to be the porthole to the underworld. Lead-free, microwave, and dishwasher safe. Approximately 1.75" x 2". Handcrafted by Designs by Anna in Durango, Colorado. 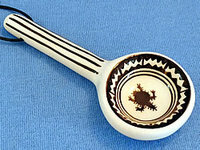 This miniature seed jar was inspired by a Mesa Verde Black-on-White pot housed in the Mesa Verde Chapin Mesa Archaeological Museum. Seed jars were typically used to store seed for the following planting years. 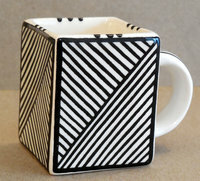 Lead-free, microwave and dishwasher safe. Approximately 1.5" x 0.75". Handcrafted by Designs by Anna in Durango, Colorado. 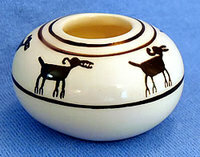 This miniature seed jar featuring a zoomorphic sheep design, was inspired by a Mesa Verde Black-on-White pot housed in the Mesa Verde Chapin Mesa Archaeological Museum. Seed jars were typically used to store seed for the following planting years.